Paula Goodall, Part Exchange Manager at Barratt Homes, North Midlands says, “Having worked closely with Spicerhaart Part Exchange & Assisted Move for the last few years, I know that when I have an enquiry, the team will get their valuers to move their diaries around to accommodate me. The team is very reliable and always delivers on its promises while ensuring a seamless sales process. 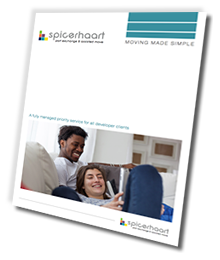 Lee Hinchcliffe, Part Exchange Manager at Harron Homes, North Midlands says, “I have worked with Spicerhaart Part Exchange & Assisted Move in a number of different roles and locations. I continue to find them pragmatic, approachable, professional and efficient, and the team always excels. In addition, its sales performance is second to none in terms of how quickly properties are sold, as well as the value they get back for those units. In my experience, it is undoubtedly one of the top companies to work with in terms of service levels for part exchanges and sales assist. Jamie Brook, Part Exchange Manager at Avant Homes, says, “Due to its in depth knowledge of the residential market and its fully managed service, the highly trained and approachable team handles enquiries efficiently and professionally and nothing is ever too much trouble for them. Gary Roberts, Part Exchange Manager at Harron Homes (Yorkshire) says, “Jan and the team are very easy to work with and have always provided the best possible service while ensuring everything fits within my timescales. Carol Johnston, Part Exchange Manager at Bellway Homes (Wales), says, “I am responsible for buying in properties, so the speed in which we get the valuations done and the reports back is absolutely crucial. The team at Spicerhaart Part Exchange & Assisted Move is very good at delivering on its promises, and the sales progression, the independent valuations, appraisals and comparisons are also exceptional.